HL-580V LTE VoIP is latest new product in the second half of 2016. It base on Broadcom5358K CPU,support 3*external antenna,5*RJ45 10/100M LAN/WAN Ethernet interfaces,2*FXS ports,support 2T2R 2.4GHz 802.11b/g/n, 300Mbps WiFi. 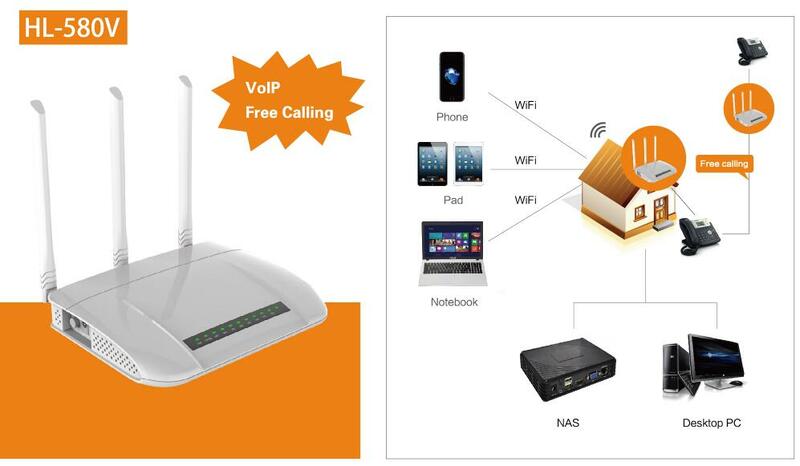 The exclusive features are that integrated LTE VoIP and PoE functions into one,few factory can reach this. teleconferencing, E-commerce, fax storage and forwarding of various information storage and forwarding. = RFC 3711, The Secure Real-time Transport Protocol (SRTP). = RFC 3911, The Session Initiation Protocol (SIP) "Join" Header. = RFC 3891, The Session Initiation Protocol (SIP) "Replaces" Header. = RFC 3326, The Reason Header Field for the Session Initiation Protocol (SIP). = RFC 3605, Real Time Control Protocol (RTCP) attribute in Session Description Protocol (SDP).